Quinn Gordon came all the way from Missoula to join us in the EVST undergrad program four years ago, but he's used the program as a jumping off point for far distant locales. In 2015 Quinn spent a month working on an elephant conservation center in Surin, Thailand, where he worked with Thais and other international volunteers. He then spent two months in Cambodia and Vietnam before coming back to Missoula. I met Quinn in the spring of 2016, when he joined us at the PEAS farm. I recognized his talent for the work right away, and appreciated his calm, unflappable demeanor and quiet confidence. Quinn took to the work quickly and stayed on at the farm across the summer, where he routinely stepped up whenever we needed an extra hand. In 2016 Neva and I officially launched our Certificate in Community Agriculture program. Community Agriculture means growing food in public, with social goals beyond the creation of calories. 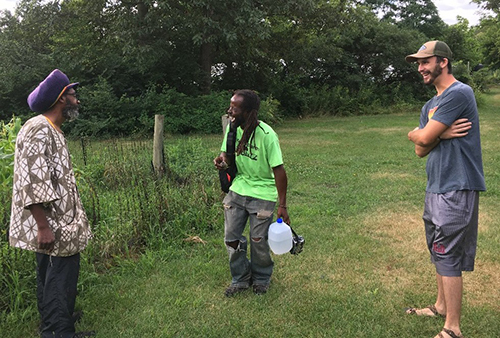 Typically, organizations use Community Agriculture to address issues like youth development, food democracy, self-determination, and these organizations have grown like weeds in the past few years. Nearly every major City in the United States has a Community Agriculture organization. Students in our Certificate program spend one summer at the PEAS farm, then the next summer they work on another Community Agriculture farm. After a summer at PEAS they become fluent in the basics of the physical and technical challenges of small-scale sustainable vegetable production, and they're ready to learn how people use this work at farms in new contexts. Quinn Gordon was our first Certificate student, and he set off last June (after a month in Sri Lanka, volunteering at a sea turtle rehab center) for Detroit. Quinn had an internship with our friend Malik Yakini's organization, the Detroit Black Community Food Security network (DBCFSN). He volunteered 20 plus hours a week at DBCFSN's D-Town farm, as part of the farmhand crew. He also worked at a local restaurant to pay his way, and work-traded for rent. Quinn said his experience at the PEAS farm and traveling internationally prepared him well for D-Town. He said they initially referred to him as "the Montanan" but the nature of the work allowed him to become part of the community at D-Town. "All of us on the farm are doing the same kind of work, and our similarities led us to the farm. In the work, the barriers between people break down" Quinn will graduate fall of 2018, and is hoping to work in Community Agriculture in another city, and when the right position opens up, join the Peace Corps. We're proud to be part of his story.